By Jim Dower: This Saturday night WBO super featherweight champion Adrien Broner (22-0, 18 KO’s) will be making his first defense of his title against No.1 World Boxing Organization contender Eloy Perez (23-0-2, 7 KO’s) at the Scottrade Center, Saint Louis, Missouri. This is going to be another big test for the 22-year-old Mayweather-esque Broner, who has already beaten Jason Litzau and Daniel Ponce De Leon in 2011. Now Broner wants to add the 25-year-old Perez’s scalp to his growing resume, and some boxing experts think Perez can win this fight. I’m not so sure about it, but he could make it interesting with his heavy pressure. Broner has fought bigger punchers than the relatively light hitting Perez, but he hasn’t fought a guy that applies pressure like him before. Broner struggled at times with the all out attack from his last opponent Vicente Martin Rodriguez, who Broner stopped in 3rd round to capture the vacant WBO title last November. However, before stopping him, Broner had some difficulties in the 2nd and 3rd rounds due to Rodriguez unloading with nonstop punches. 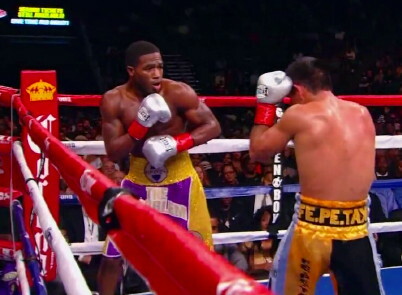 Broner was eventually able to catch him with a big shot while Rodriguez was coming forward. Broner then flurried on him to put him down for the count. Perez will likely come at Broner in the same way by throwing a lot of punches in hopes of overwhelming Broner’s defense. It’s going to open up a lot of counter punching opportunities for Broner, and Perez is going to have to possess an excellent chin if he doesn’t want to get knocked out in this fight due to Broner’s big power. His counter punching makes Broner much more dangerous because he’s often able to catch them with big shots when they least suspect it. Broner is highly thought of by HBO, and they’re definitely interesting in continuing to televise Broner’s fights in the future in hopes that he’ll become a big star. He’s got a fighting style that is the carbon of Floyd Mayweather Jr., albeit not nearly as fast him in terms of hand speed. However, Broner, for his weight class, is a big puncher and he makes up for what he lacks in hand speed by having big power.